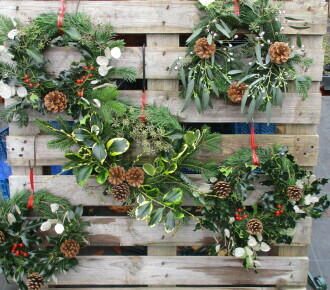 Last 12 Christmas Trees – REDUCED! 5 different varieties of cut and pot grown trees this year. Nordmann Fir, Fraser Fir, Noble Fir, Lodgepole Pine and Norway Spruce. The cut trees are Nordmann Firs, Fraser Firs, Noble Firs, Lodgepole Pines and Norway Spruce which range from 5 ft to 10 ft high. You will need a stand or bucket to put them in. We have a small selection at the nursery to choose from if you don’t already have one. We also have trees on logs ranging from 4 ft to 8 ft high where the tree is inserted in a log stand. You can reserve your trees from 30th November and we will look after them up until 20th December. 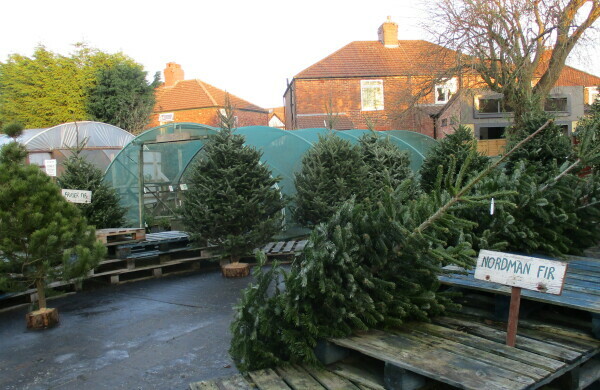 Fir trees – 3 different varieties this year. All the Fir trees have very low needle drop and will retain their needles, as long as you keep either the log constantly wet or ideally a stand with a water reservoir topped up with water. They all have fragrant foliage. It takes 7-10 years to produce a 6-7 feet tree! NORDMANN FIR – Abies normanniana. Symmetrical shape, with strong branches. The needles are long, mid green and soft. It is a wide tree, so you will need a reasonable space to show this tree off to its best advantage – for a 6ft tree allow approximately 5ft. Very low needle drop. FRASER FIR – Abies fraseri. Pyramid shaped with branches that turn slightly upward. Soft flat needles of blue-green above and silvery-grey bands on the underside. Pleasant citrus pine fragrance. Compact, dense shape. It is a narrow tree, making it ideal where space is at a premium. Very low needle drop. NOBLE FIR – Abies nobilis. Very symmetrical horizontal branches. Needles turn upwards, exposing the lower branches. Soft, flat, blue-green foliage. The stiff branches make it a good tree for heavy ornaments. Very low needle drop. LODGEPOLE PINE – Pinus contorta. A wonderful natural pine scent. Long flat green needles. Shape of tree is like a monkey puzzle tree. Low needle drop. All our Lodgepole Pines are on logs this year. NORWAY SPRUCE – Picea abies. Traditional Christmas tree. 8-11 years to grow a 6-7 feet tree! The needles are mid to dark green and prickly to touch, but the strong branches make it an ideal tree to decorate. It has its own unique scent, feel and shape. Do not allow to dry out. Best in a stand with a large water reservoir. Water well – a gallon of water a day!